Soil stabilization with cement, bitumen, lime, chemical stabilization,geotextile, grouting etc. are discussed. It is a method of improving soil properties by blending and mixing other materials. The soil stabilized with cement is known as soil cement. The cementing action is believed to be the result of chemical reactions of cement with siliceous soil during hydration reaction. The important factors affecting the soil-cement are nature of soil content, conditions of mixing, compaction, curing and admixtures used. The quantity of cement for a compressive strength of 25 to 30 kg/cm2 should normally be sufficient for tropical climate for soil stabilization. Lime, calcium chloride, sodium carbonate, sodium sulphate and fly ash are some of the additives commonly used with cement for cement stabilization of soil. Slaked lime is very effective in treating heavy plastic clayey soils. Lime may be used alone or in combination with cement, bitumen or fly ash. Sandy soils can also be stabilized with these combinations. 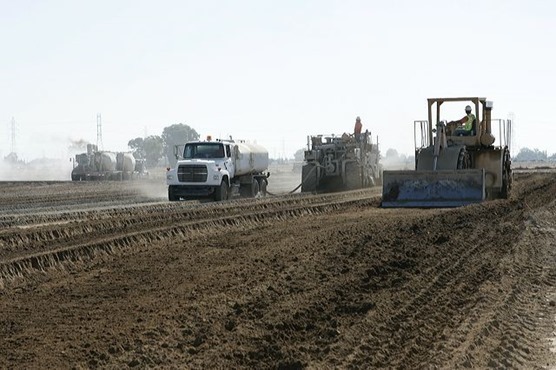 Lime has been mainly used for stabilizing the road bases and the subgrade. Lime changes the nature of the adsorbed layer and provides pozzolanic action. Plasticity index of highly plastic soils are reduced by the addition of lime with soil. There is an increase in the optimum water content and a decrease in the maximum compacted density and he strength and durability of soil increases. Normally 2 to 8% of lime may be required for coarse grained soils and 5 to 8% of lime may be required for plastic soils. The amount of fly ash as admixture may vary from 8 to 20% of the weight of the soil. Calcium chloride being hygroscopic and deliquescent is used as a water retentive additive in mechanically stabilized soil bases and surfacing. The vapor pressure gets lowered, surface tension increases and rate of evaporation decreases. The freezing point of pure water gets lowered and it results in prevention or reduction of frost heave. The depressing the electric double layer, the salt reduces the water pick up and thus the loss of strength of fine grained soils. Calcium chloride acts as a soil flocculent and facilitates compaction. Frequent application of calcium chloride may be necessary to make up for the loss of chemical by leaching action. For the salt to be effective, the relative humidity of the atmosphere should be above 30%. Sodium chloride is the other chemical that can be used for this purpose with a stabilizing action similar to that of calcium chloride. Sodium silicate is yet another chemical used for this purpose in combination with other chemicals such as calcium chloride, polymers, chrome lignin, alkyl chlorosilanes, siliconites, amines and quarternary ammonium salts, sodium hexametaphosphate, phosphoric acid combined with a wetting agent. Electrical stabilization of clayey soils is done by method known as electro-osmosis. This is an expensive method of soil stabilization and is mainly used for drainage of cohesive soils. In this method, stabilizers are introduced by injection into the soil. This method is not useful for clayey soils because of their low permeability. This is a costly method for soil stabilization. Geotextiles are porous fabrics made of synthetic materials such as polyethylene, polyester, nylons and polyvinyl chloride. Woven, non-woven and grid form varieties of geotextiles are available. Geotextiles have a high strength. When properly embedded in soil, it contributes to its stability. It is used in the construction of unpaved roads over soft soils. Reinforcing the soil for stabilization by metallic strips into it and providing an anchor or tie back to restrain a facing skin element.